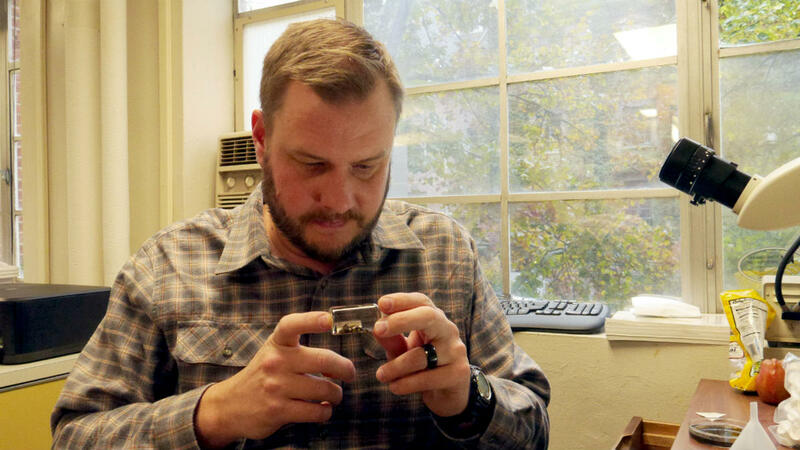 Ryan Dunbeck started his University of Idaho research project during spring 2016 by developing special solar-powered, un­derwater cameras for studying lamprey — an unusual North­west creature. “Lamprey have watched the landscape evolve around them; they’re prehistoric,” Dunbeck said of the freshwater fish with long, cylindrical bodies and several rows of sharp teeth. Dunbeck, 37, of Olympia, Washington, enrolled at UI in fall 2015. He decided to pursue a degree in ecology and conservation biology with a minor in fisheries in the College of Natural Resources. As part of his studies during his first year, Dunbeck attended a lecture from a graduate student on the impact of lamprey and their carcasses on the rivers of the Northwest. He was immediately intrigued by the subject and decided to make it the topic of the independent study project required for his degree. “There’s a lot of work done studying salmon; it’s hard to even make your way through all the research. But there’s comparatively very little on lamprey, even though they may be as vital for the ecosystem,” Dunbeck said. Dunbeck explains that because lamprey aren’t considered a game fish of economic value, fewer people are inclined to study them. Howev­er, that means when a student is interested, there is no shortage of opportunities. After the presentation, he talked with his advisor, assistant professor of fish and wildlife sciences Chris Caudill, and found himself thrown head-first into the subject. Caudill and the master’s student who in­troduced Dunbeck to the subject, Matt Dunkle, have helped with and directed much of Dunbeck’s work. “All I had to do was ask, and all these opportunities became available,” Dunbeck said. 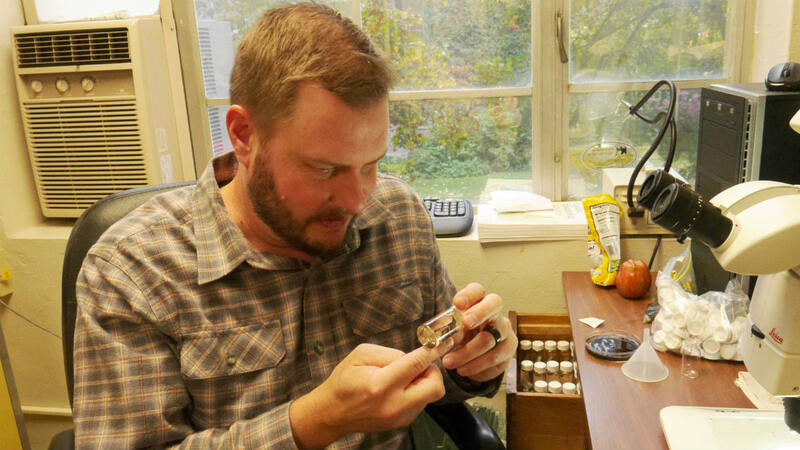 Ryan Dunbeck examines samples from his research on lamprey, which he studies in the Yakima River. Dunbeck received an OUR Undergraduate Research Grant. Learn more. In summer 2016, Dunbeck set up his cameras along a tributary to the Yakima River to examine the carcasses of lamprey that had died nat­urally after mating and study how they interact with the ecosystem. Lamprey carcasses are a food source for other fish species. The Yakama tribe was instrumental in his research, providing the study site, travel expenses and an intern to assist him with his study. Grants from the Office of Undergraduate Research and NSF EPSCoR also funded his work. While the lamprey is not considered a “game fish” to state govern­ments, the Yakama have a strong tradition of harvesting the fish. Therefore, they are interested in preserving it. Like salmon, lamprey are deeply affected by the dams along the river. Dunbeck has learned perhaps less than 50 percent make it pass the dams, because the salmon-specific fish ladder design makes passage much more difficult. Dunbeck is now analyzing the data he collected in summer 2016 and plans to make another trip to collect more data in 2017. He hopes to continue studying lamprey as he moves into graduate school and into the workforce. “I’m super stoked to bring more awareness to these underrepresented fish,” he said. Dunbeck’s research on lamprey was supported by the Yakama tribe, who consider the fish an important part of their culture.